﻿The full list of the 116 Palestinians and 16 Israelis killed since October 1st is below. The Following is a list of names of all Palestinians shot and killed by Israeli fire in the occupied West Bank, including Jerusalem, and the Gaza Strip, including one in the Negev, in the period between Thursday October 1st and the end of December 10th, as confirmed by the Palestinian Health Ministry. 74. Ashraqat Taha Qatanany, 16, Nablus. Rammed by car & shot under questionable claim that ‘she had a knife’. 84. Fadi Mohammad Mahmoud Khseib, 25, Jerusalem. Killed by armed paramilitary settler after car accident. 94. Abdul Rahman Wajih Ibrahim Abdul Majid, 27. Killed at entrance to Aboud village when he pushed back against a soldier who had slapped him in the face. He was shot multiple times by three soldiers. 95. 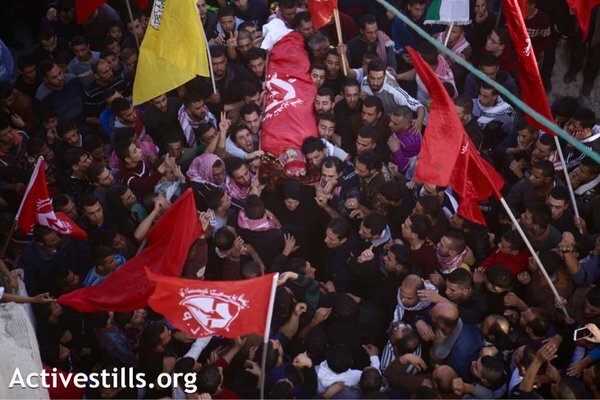 ‘Amer Yaser Iskafi, killed by numerous gunshots by Israeli soldiers north of Jerusalem. 96. Malek Shahin, 18, Deheishe camp in Bethlehem. Shot in the head with exploding bullet during demonstration against invading Israeli forces. 99. Shadi Hussam Doula, 20. 100. Ahmad Abdul-Rahman al-Harbawi, 20. 102. Mohammad Hisham al-Roqab, 15. 103. Adnan Mousa Abu ‘Oleyyan, 22. 104. Ziad Nabil Sharaf, 20. 106. Marwan Hisham Barbakh, 13. 107. Khalil Omar Othman, 15. 110. Yahya Abdel-Qader Farahat, 23. 111. Shawqie Jamal Jaber Obeid, 37. 112. Mahmoud Hatem Hameeda, 22. Northern Gaza. 113. Ahmad al-Sarhi, 27, al-Boreij. 115. Khalil Hassan Abu Obeid, 25. Khan Younis. Died from wounds sustained in protest earlier in the week. 116. Salama Mousa Abu Jame’, 23, Khan Younis.